John Wiseman was born in Foston c1823. He first married Mary Clark and worked as a pedlar/ hawker. In 1851 he was living in Foston with his widowed mother (who was on parish relief). In 1861 he and Mary were living next to James Whyley. Mary died in 1864. John was a farm labourer. In Sep 1878 he admitted being “rather the worse for beer” at Foston and was fined 10/ plus 11/6 costs. In 1890 his neighbour Joe Muxlow was bound over for threatening to kill John. In Apr 1899 John Wiseman and William North of Foston were convicted of stealing 8 stones of potatoes from William Hutchinson’s farm in Marston. Wiseman had been working on the farm that day and was seen crossing a field with them at night. He was given 4 weeks hard labour. North (who had previous convictions) was given 6 weeks. In 1891 they were living on the Great North Road in Foston. In 1911 (aged 88) he was still working and their granddaughter Mary Fines Wiseman was staying with them. After John died in 1913 Eliza moved to 40 Millotts Yd, Hucknall (presumably with one of her children) until her death in 1918. In 1900 (Boer War) John and Henry Wiseman of Foston were both serving as privates in the Derbyshire Regiment. In 1900Hannah Wiseman was working a domestic servant for Joseph Singleton (farmer) in Bottesford. In Feb 1900 Henry Goodson, a servant on the same farm was charged with aggravated assault against Hannah. The case was dismissed and Hannah had to pay costs. Later that year Hannah sued Joseph Singleton for the balance of wages. She’d been hired the previous August (not the usual hiring time) to work until May for £7. After the alleged assault in Jan she’d become seriously ill and, after a fortnight, her mother had taken her home to Foston. A month later Singleton refused to take her back. It was not clear whether the £7 contract was for Aug-May or a full year. In 1901 Alfred Wiseman (18) was working as a farm servant for Francis Codd (farmer) at Glebe House, West Allington. By 1911 he was working as a coalminer’s loader and living in Ilkeston with his older sister Selina, who was now married to John Fisher, a blacksmith (Selina died in 1918). Alfred enlisted in the Sherwood Foresters (Notts and Derby Regiment) at Derby in Mar 15. At the time he was still living with Selina’s family at 29 Whitworth Rd, Ilkeston. He moved from 2/5th Battalion to 3/5th. Then in Oct 1915 he sailed from Southampton to Rouen to join 1/5th battalion in France. In Feb 1916 he was hospitalised with frostbite (as was James Whyley from Foston), before being sent home to England in March and sent to a reserve battalion. In Jan 1917 he returned to 1/5th Battalion in France. In May 1917 the battalion was in reserve at Bully-Grenay, but provided working parties for the forward area. 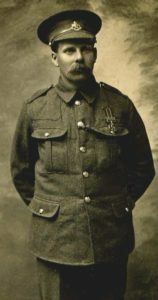 On 28th May Alfred was shot in the leg and sent to a Casualty Clearing Station but died the next day (age 20). He was buried at Lillers Communal Cemetery, although his grave is not known as the area was later shelled by the Germans. The sister in charge of the Clearing Station wrote to his mother. His personal effects (pipe, photos and postcards) were to be sent to his mother (Eliza) in Foston. Post war (and after Eliza’s death) his medals were to be sent to his brother John, who was living at Jubilee Hill (Jubilee Cottages? ), Pye Bridge, near Alfreton.